There are many cases when a better cut can reveal a better color of a gemstone, and many cases when a gemstone’s appearance has some flaws because of its cut. 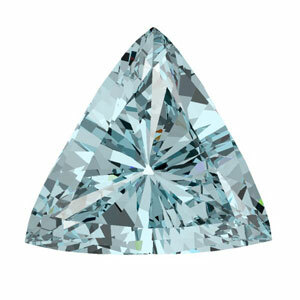 Unlike diamond, colored gemstones cutting allows for a lot more freedom. A cutter can choose among many shapes, facet patterns and proportion sets. The primary goal for a cutter is to achieve the best possible color and to reveal the potential of every piece of rough material. Because of the complicated nature of interaction between light and gemstone facets, every facet matters. Cutting mistakes can become evident only after the last facet is polished. 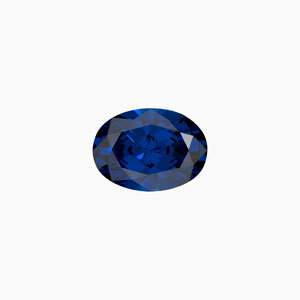 Today many commercially available colored stones have various optical flaws in their appearance. That is why cutters are looking for a way to predict the optimal appearance of future gemstone’s. Recent advances in diamond scanning technologies have introduced computer 3d models of diamonds. There are Sarin, OGI, and OctoNus scanners commercially available. The same technology can be used for colored stones as well. Libraries of 3D cuts are available now on the Internet for free. Another type of 3D cuts is parametrical cuts that can be opened in software products such as DiamCalc by OctoNus or GemCad by Robert Strickland. These cuts are parametrical: they are symmetrical and determined by a set of parameters. Modern software products, for example DiamCalc, can model gemstones of a particular color if a user imports an absorption spectrum. 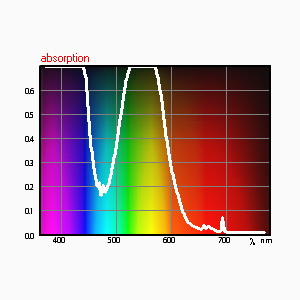 This spectrum can easily be recorded with a conventional visible range spectrometer or obtained from an Internet database. The described technology combines gemstones absorption spectra and 3D modeling for predicting the color appearance of gemstones before their cutting and polishing. 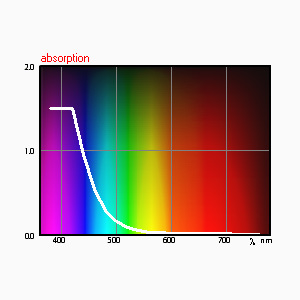 A recorded spectrum should be adjusted in order to avoid all light losses and calculating an absorption coefficient, especially if this spectrum is not recorded through two parallel windows. 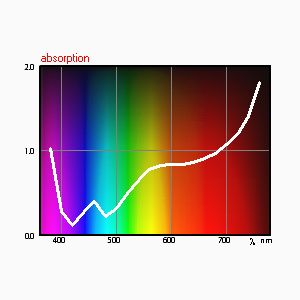 To properly simulate a colored gemstone image on a computer screen a software product should model not only stone itself, but also illumination and should also take into account properties of human vision. Every cut can be characterized by its size, shape, facet arrangement, proportion set, and symmetry deviation. Every gemstone material is characterized not only its spectrum but also refraction indexes and dispersion that should be incorporated in the model. 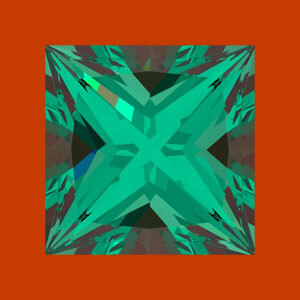 DiamCalc software creates rendered gemstones images by tracing all light beams that come from light sources through a gemstone to an observer’s eye, and calculates the color of every virtual facet, dependant on the path of light rays and material absorption. 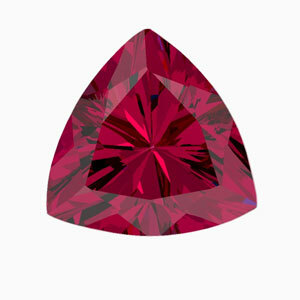 Parametrical or scanned cuts can play the role of the gemstone. The resulting images provide a lot of valuable information. Color appearance changes with size, shape, facet arrangement, cut proportions, distance, illumination, background, stone’s position, and viewing conditions. On the Figure. 1 one can see pairs of DiamCalc images. In each pair the gem material is fixed, but one model in each pair is less attractive while the other has better look. The reasons are explained in captions and every example illustrates how to improve a gemstones appearance by computer modeling. Figure 1. Pairs of gemstones DiamCalc models made on various gem materials. Scanned models are obtained with the Helium scanner. A. Cut influences color. 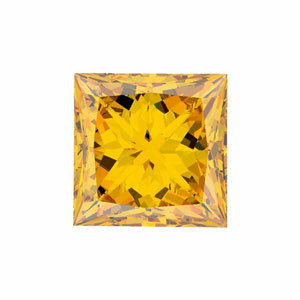 A yellow radiant cut diamond (right) has more intense color than a round cut diamond (left) with the same 8 mm size and the same spectrum. Lighting conditions: Jewellery Store. 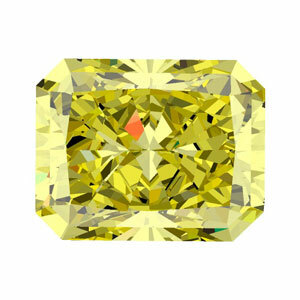 A light yellow natural diamond "Diamond yellow N3" spectrum obtained through 3.5 mm thick plate along an triad axis direction. 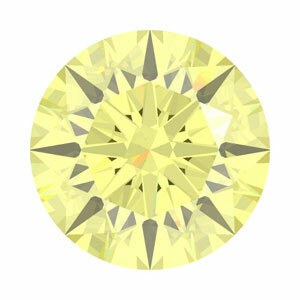 This diamond is Ia type and its color is related with N3-N2 centres. B. Windows (see through effect). 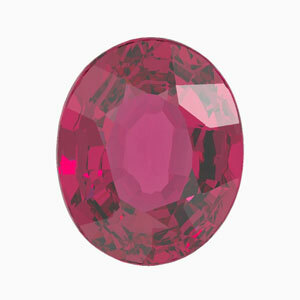 The traditional oval cut (left) for this ruby model has a see through window in the center while the trillion cut (right) has bright red flashes in the central zone. Size of both stones is 7 mm, lighting conditions – Jewellery Store. "Corundum_Red_direction2" spectrum of a red synthetic corundum material obtained through the 11 mm thick plate with another arbitrary direction. Red color of that stone is related with Cr3+ adsorption features. D. Light leakage through pavilion. The orange background behind these 1,50 ct emerald models is visible through the emerald cut on left but less visible through the princess cut on the right picture. 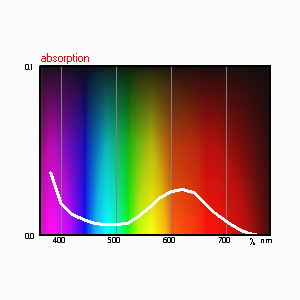 A green natural emerald "Emerald" spectrum is one of DiamCalc standard spectra. 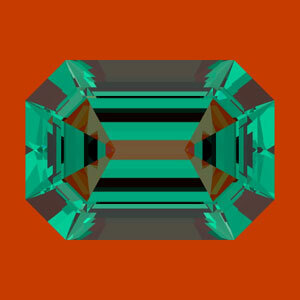 Emerald color is related with Cr presence. E. Black zones. Blue irradiated topaz trilliant shapes can reveal different appearance: the left model has black zones under the table while the right model has better look because of facet arrangement and proportions. Lighting conditions: Jewellery Store. The weight of each stone is 5 ct. A blue irradiated topaz "Topaz_paralC" spectrum obtained through 13 mm thick plate along parallel C-axis direction. F. Lighting creates a difference. 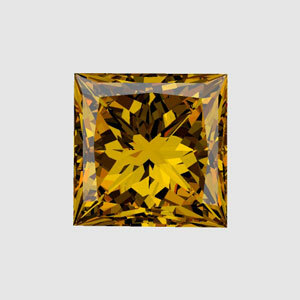 This 0,72 ct scanned model of a princess cut synthetic diamond looks orange-yellow under Jewellery Store lighting (left) and much more brown under Office lighting conditions (right). 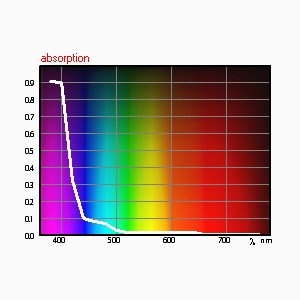 "Synthetic_diamond_Yellow" spectrum obtained through 5 mm thick plate. 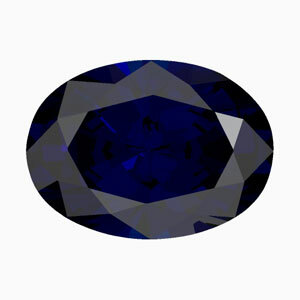 This diamond is Ib type and its color is related with C-centers absorption. 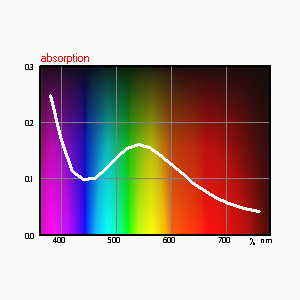 G. Black zones in connection with light conditions. 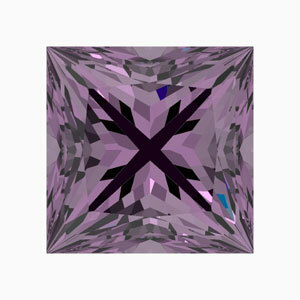 This 2,20 ct princess cut amethyst has a good color distribution in the Dialite lighting (left) but the color is better in Jewellery Store lighting (right) except for an un-attractive cross shaped dark zone in the center. 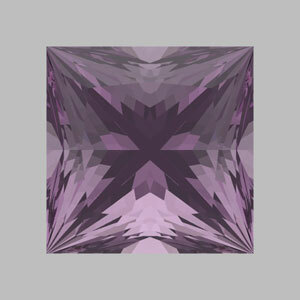 A moderate violet natural amethyst "Amethyst" spectrum obtained through 10 mm thick plate along an arbitrary direction. H. Bow Tie effect. 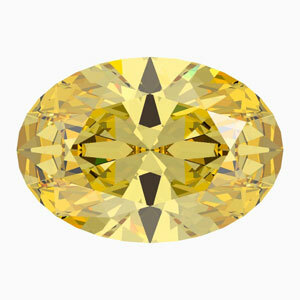 The oval cut yellow CZ has a distinct Bow Tie effect (left) while another oval cut with four pavilion main facets has avoided the bow tie and has better color distribution and more saturated overall color (right). 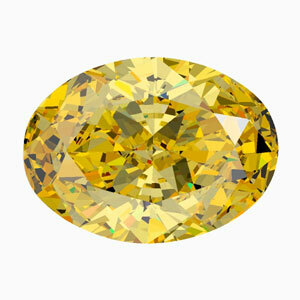 The weight of each stone is 2,17 ct. A yellow cubic zirconium (CZ) spectrum "CZ_yellow" obtained through 4 mm thick plate. Color of that stone is related with REE adsorption. Taking into account all limitations mentioned above it is important to verify the technology. 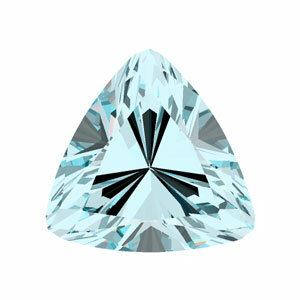 Verification was done on relatively inexpensive materials: colored CZ, blue topaz and synthetic corundium. There is a very good matching of predicting models and resulting gemstones, being observed in the similar lighting conditions, if a cutter properly follows all cutting requirements.